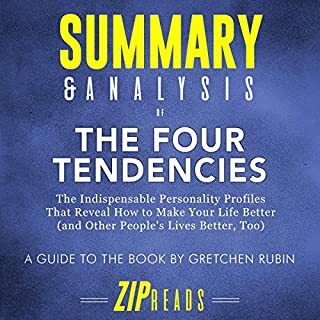 The Four Tendencies: The Indispensable Personality Profiles That Reveal How to Make Your Life Better (And Other People's Lives Better, Too) (2017) by Gretchen Rubin is a self-help book that outlines a framework for understanding motivation. 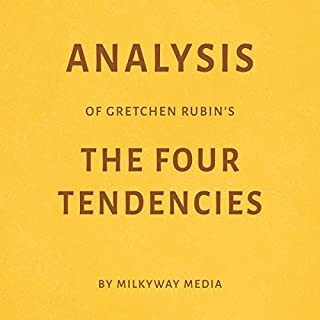 Rubin believes that everyone naturally falls into one of Four Tendencies, or personality types, based on how they respond to different types of expectations.... Purchase this in-depth analysis to learn more. 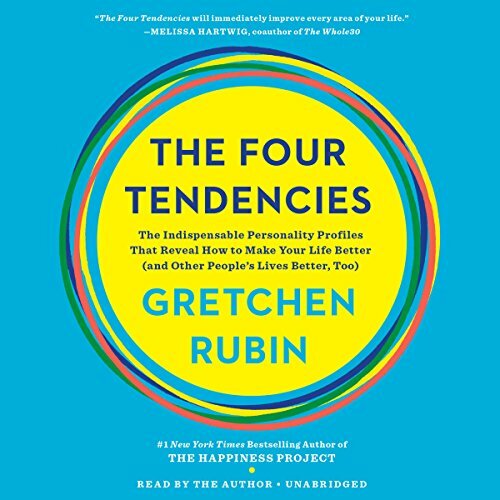 Best-selling author Gretchen Rubin (The Happiness Project, Better Than Before) reveals the surprising truth about the four hidden personality types that drive everything we do. Learn how to understand yourself better - and also how to influence others more effectively. I recommend this book to anyone that has trouble understanding the motivations of others, especially if you are in healthcare or fitness. It will illuminate everyday choices in a way that will change your life. * Upholder - Will make and keep new year's resolutions. * Questioner - Think Jan. 1 is an arbitrary date. Will make and keep resolutions when they feel like it. * Obliger - Stopped making new year's resolutions because they can't keep them. * Rebel - Don't believe in making resolutions. * Upholder - Tell them what needs to be done and when, and they'll tell you whether they can do it. * Questioner - Explain &quot;why&quot; something needs to be done and ensure they understand the purpose/value. Then tell them what needs to be done. * Obliger - Tell them who needs it. Make sure they're not overcommitted before asking them to do something. * Rebel - Don't tell them to do something because they don't like being told to do it. Explain the situation and give them a choice. A common technique for rebel children is saying &quot;Do you want a hamburger or a hot dog,&quot; instead of telling them to eat lunch. This book was terrible for so many reasons. I could write an entire thesis on everything that’s wrong with it, but this is a review website so I’ll just list a few of the things I had issues with. 1. The writing itself was terrible. It felt like she only had enough to say to fill about 25-30 pages, so she spent the rest of the time repeating things she’s already said. She also contradicted herself on numerous occasions, thereby further destroying her credibility. This credibility was already on shaky ground due to the fact that she has no credentials to say the things she does. She’s a lawyer turned author who noticed “tendencies” in the people around her (I repeat, THE PEOPLE AROUND HER), decided that all mankind fits into one of these four spurious categories, and then made a quiz, an app, a book deal, and a ton of money off of it. She had no scientific training and her data is biased by the fact that the questions on the quiz are excessively basic, short, and skewed and the conclusions drawn can therefore not be trusted in a scientific manner, as they were not tested in a scientific fashion. The book is written with a strong leaning towards the author’s own “Upholder” tendency, with blatant condescension toward the other three. Even within the “Additional Materials” chapter, there is nothing except her podcast, and her app, thereby leading me to believe that even she knows she just made this stuff up, and that it has no basis in reality. 2. 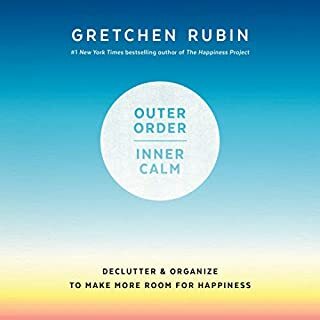 Gretchen Rubin says that every single human on God’s green earth fits into one of these for categories and that THEY CANNOT CHANGE. I take issue with that for a number of reasons. To say that people cannot change their tendency, the personality or their habits is a lie. It happens all the time. We change based on situations, circumstances, and age. I was categorized as an “Obliger” on her quiz. And then I read the chapter on it. I am nothing like that chapter. I am not helpless, insipid, and incapable of motivating myself to do something. I don’t need other people to hold me accountable. I have no problem meeting “inner expectations.” The basic questions on that quiz (“Are you a people pleaser? How do you feel about New Years Resolutions? Etc...”) have led her to categorize most of mankind as Obligers. Every example she gives (of each of these tendencies) seems to be about the most extreme behaviors, most of which would result in the person in question being in severe danger of being slapped by people around them for not knowing how to act like a reasoning, thinking, functioning adult. I was left thinking that each example in each tendency needed to be in some sort of medication to assist with their emotional and behavioral issues. 3. I take issue with the fact that she arbitrarily lists film and literary characters as shining examples of these tendencies. This further impresses upon the reader that there is a complete lack of any actual psychological study going on. The characters haven’t taken these quizzes. She’s so excited about this idea of hers that she sees it wherever she goes. At one point she references Jane Eyre as a Questioner, simply because Jane’s aunt says to her in the beginning “Jane, I don’t like cavillers or questioners.” As a devoted Jane Eyre fan, I can tell you that “Questioner” would NOT be her tendency. Read the book. You’ll see. Same things Hermione, the poster child for the “Upholder tendency.” Bilge. Hermione breaks rules frequently as long as she feels on solid ground when she does so, and she will only do what she’s told as long as SHE can see that it’s right. Which makes her a Questioner. Then when she uses examples of real people, they’re so ludicrous that you wonder if she just made them up. “An Obliger said this...” “A Rebel friend told me...” “I got a letter from and Upholder manager and they said...” Never are we given names. Never are we given any proof that she’s tweaked or adjusted her original theory to allow for further research. Never do we get the sense that she ever checks up on herself, or that there is any room for error. She never even lists any of the negative responses she’s gotten, and I know she’s gotten them, because I’ve seen them in her podcast comment section. 4. Finally, and most importantly, the advice in this book is terrible. It should not be followed. Why? Because the advice is basically that other people around you need to cater to whatever tendency you have. If you are a manager, you should spend your time making sure that you know the tendency of each of your employees, and catering to it, while also catering to your own. There is no actual sense of personal accountability here. People don’t have to take responsibility for themselves and their behavior because “that’s just how they are.” Nonsense. She gave the example of mayor who told people in NY to evacuate due to a hurricane. Not everyone did and lives were lost. She actually says that had the mayor taken tendencies into account he could have provided information in four different ways to suit said four different tendencies. To which I say, if you’ve been told to evacuate a place for your own and others safety, and you choose to stay, that’s on you. You were told. People do not have the time to mollycoddle others based of Gretchen Rubin’s spurious tendencies. Another example was of a Rebel child who wanted to drop out of school because she felt it was restrictive. Her parents allowed it. Within a short amount of time the girl decided to go back and the school decided to cater to her needs, the needs of a spoiled brat. Again, this has the potential to cause so many problems. Most schools will not react that way, nor should they. Most children won’t decide to go back, because they’ll like the freedom of having made that choice. And if they are unable to pass the notoriously difficult GED exams, what then? Where are we then? At times there are blatant mistruths. She mentions a military Rebel, who says that he was able to attain rank while breaking all the rules he wanted. I call BS. I come from a military family and I know they do NOT allow insubordination. They can’t afford to because that could cost the lives of other soldiers. Breaking rules in the military gets you dishonorably discharged or worse. Ask any military person. You obey your commanding officers or you pay the penalty. Her advice in child rearing seems to be (as with everything else) “cater to the child’s tendency.” Every child I have ever known (and I come from a large family and also taught for years) is every single one of these tendencies, frequently all at once. They question everything, follow the rules, want to please everybody, and don’t like to be told what to do. Oh wait, that’s also called being human. We are ALL that way. Doctors won’t even start testing children for behavioral or mental disorder until after the age of 5, so where does she get off labeling these children for life, while ignoring any evidence that will/can/does prove that she’s wrong. Her statements are contradictory. “This is what you are, except not completely because these tendencies are affected by other personality traits.” “This is who your tendency should pair up with, except that it really doesn’t matter because all of these tendencies can work together.” She’s condescending and rude to the other tendencies. 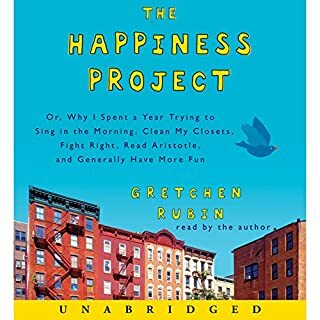 Gretchen tends to take good concepts and turn them into mediocre books. The Four Tendencies framework is super helpful, especially for me - a rebel - since it helps me understand how to motivate myself, and to understand how other people function differently. Gretchen is an upper-class, thin white woman. She writes from a place of privilege, with no acknowledgment of it. Her examples seem mostly drawn from people who live similar lives (hetero, married people who are often parents) and the whole book feels very...clueless at times. She offers her opinions about celebrities, research articles, and external situations where she's really just guessing ("I bet they had this tendency, and that's why!"). I'd have been so much more interested if she conducted her own research beyond some general surveying. 90% of the book seemed to be stories about either weight loss or a spouse's epiphany about their spouse. As a body-positive advocate, all the weight loss talk really turned me off. And she so frequently seems to write off the tendencies as a series of individual quirks we have no control over. Not once does she address how the tendencies develop, or how we might strengthen responsiveness to inner or outer expectations. How do obligers discover what they really want? How do questioners know when they have enough information? There are so many paths she could have explored and didn't. Instead, we get some useful information in a repetitive package. It's a bit better than her other books, but I still don't think I'd be able to get through it a second time. I'd have preferred the Cliff's notes. I must admit I got bored with this one before the end, so take that into account as you weigh this review. I don't know that the thesis here is all that earth-shattering. It really is just a single plane of analysis--four attitudes people use to approach situations--instead of a multi-layered, illuminating diagnostic tool. It is more of a blog post topic than a book. But it has some value. I think you could probably find a sufficient summary from the online quiz and skip the book. As a previous psych student, I can't resist a book about personality and more effective communication. I used to think if people wanted to do something.. they would just do it! My whole life I've had discipline and have had no problem finding ways to accomplish things other people lay out for me as well as things I lay out for myself. I would often tell others.. if you want to do it, then why don't you? I'm a textbook upholder. I'm also a fitness coach and find this to be invaluable for keeping clients motivated that don't think like me (a lot of people won't think waking up at 4am just to get a workout in before work is a good strategy even if it means they'll get it done! Haha). I found the information about romantic, parent/child, and professional relationships very useful as well. Overall very interesting and useful and I'm having a fun time learning the tendencies of other people in my life! 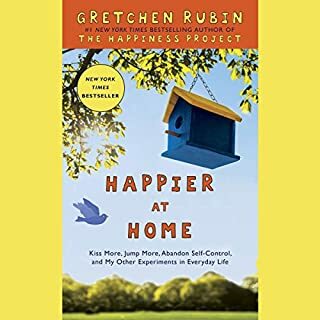 I have read Gretchen Rubins other books, and they didn’t disappoint. In my opinion, This one was better than those. In other personality quizzes, or theories, or books.... I usually am very close to an overall mix of the categories that they are talking about. 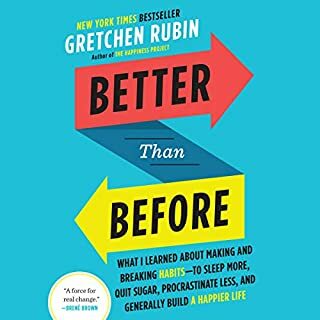 So going into this book The Four Tendencies, and her other book ‘Better than Before’ I felt it was just going to be the same - I had very little faith in it. Buuut... I’m a questioner... and this book identified that sooo clearly. I would have thought that this section was written about me... it was as if she was secretly following me around listening to my every word and watching every move. Even her examples for a questioner... I have done. And the week before I read this book I actually said to my friend “I know! I know too much Information and I can’t stop getting more, when does it end?! I exhaust myself, so I must be exhausting you.” Anyway, I recommend this book to anyone. It’s a good read. The four tendencies is a miracle worker. I have never been able to encapsulate my “tendencies” or hear how they dictate my life as well as they have been described in this book. Thank you very much as I will be taking full advantage of all the extra material to further understand, navigate, and process my life in the best way possible. Also, I look forward to my partner listening to this book as we can better communicate, navigate, and build a stronger relationship for our future.